Several metaphors have been rattling around in my head as I attempt to capture the quality of the energy of this Spring and Summer. I think I’ll go with the rodeo one for now. After all, I just got back from a trip to Texas. Bull riding. Let’s imagine what it must be like to be the cowboy in the chute sitting on top of the bull. Let’s imagine what it must be like to be the bull confined to the chute with a cowboy on our back. Let’s imagine that energy being released when the door is pulled away. My life has been a bit like this lately. Here are the astrological clues. For one, I am a Sun sign Aries. This New Moon is in my Sun sign. Aries comes around once a year, no big deal. This year, and very soon, two outer planets will ingress into Aries – Uranus and then Jupiter. They will be part of an opposition to another outer planet, Saturn. Then all of these planets will square the outermost planet – Pluto. Some astrologers are calling this event, which will heat up this summer, as the Cardinal Climax. The Mountain Astrologer magazine has been doing a good job of covering this. (This blog is devoted to these transits ) Aries is a Cardinal sign, so is Cancer, Libra and Capricorn. Clients and friends who are Aries have been showing up in greater numbers lately to check in with the stars. It seems that something is up. The other Cardinal signs are feeling it too, especially if you were born at the beginning of the sign. Back to the rodeo. Aries is the impulse to be, act, differentiate, and fight if necessary. Mars is the ruler of Aries, and Mars has not been acting nice as far as this fire sign is concerned. Mars went retrograde in December 2009. Think pent up bull. Mars turned direct in March. Think the door is open. Mars will finally clear the area of the zodiac that it has been traversing during this whole period on May 17. Think, the ride has started. I’ve noticed that Mars-ruled people, Aries and Scorpio, have felt this retrograde more strongly. Leo people haven’t been too happy either. I suspect the effect of Mars retrograde is stronger this time because Uranus and Jupiter are about to move into Aries. Perhaps because of that has been written about these coming transits or perhaps because I am an Aries, I have been noticing things speeding up around me, moving at such a speed that I know I can’t control it and just hope I can maintain mindfulness through it. That is what I most desire — not to get so swept up in the bull ride that I surrender my ability to choose my actions and reactions. All zodiac signs are useful. All have their spark of genius and appropriateness, even impetuous Aries. For those who are not Aries, these qualities may come in handy over the Summer for you as well. Sometimes we need to clear the slate and start over. Aries is good at that. Sometimes we need to act quickly and instinctively. Aries is good at that. Sometimes we need to recognize our mistakes and the mistakes of others and move on. Aries is good at that too. This New Moon, before the ingress of Uranus and Jupiter, it is a good idea to take note of the energy within and around you. Are you on the bull about to be released or do you feel as if you are holding on for dear life? How do you wish to meet this energy? What intention serves you the best? 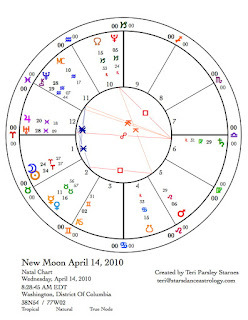 New Moon in Aries April 14. In addition to the energy described above, this New Moon finds Mercury stationing retrograde in the steady sign of Taurus. Aries and Taurus have a love-hate relationship. They secretly need and admire each other but often have a hard time admitting it. Taurus gives Aries something earthy and solid to push against. Taurus helps Aries to stop and take note of the impact of previous action. Aries helps Taurus to initiate necessary changes that can contribute to the Taurean desire to sustain and steward resources. With Mercury stationing in this sign, there may be a bit of confusion about how Aries and Taurus can get along. In order to maintain control, we or others we encounter may stubbornly dig in and refuse to discuss or budge on important issues. Since Mercury retrograde always invites us to rethink our approaches to mental activity, we will need to employ Taurean patience as we try new strategies for communication. 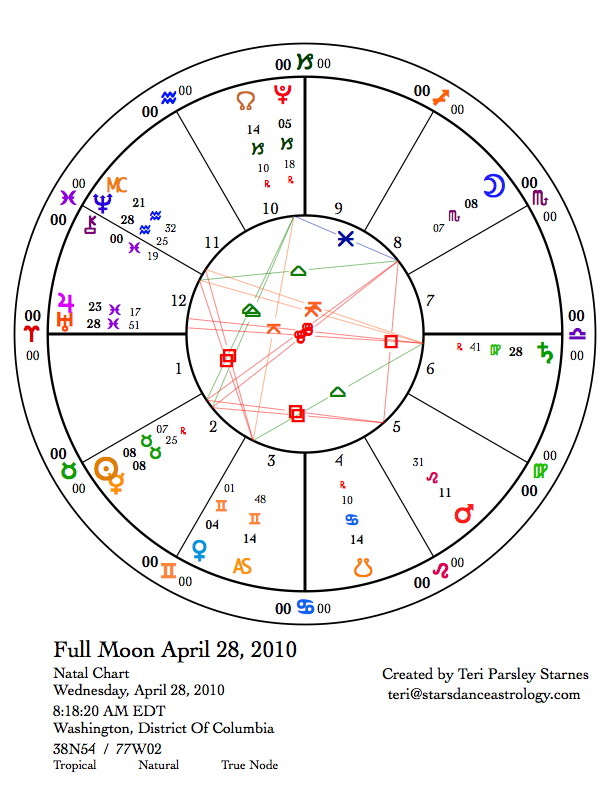 The biggest challenge to thought and communication may come around April 25 when Mercury squares Mars. The Mercury retrograde is background interference to the really important transit of this month. Saturn will exactly oppose Uranus for the fourth time in this sequence of five on April 26. The exact date is a little unimportant. We have been feeling these two planets face off since the Fall of 2008. A recap: Uranus is the planet of revolution. Saturn is the planet of authority. These two impulses are necessary and they are at a critical, even excruciating, point in their cycle. The word, “opposition” pretty much describes the energy that exists between these two planets. We only need to look at U.S. politics for the last year and a half to notice the effect of this ongoing opposition. Since 2008, Uranus and Saturn have been opposing each other from the Mutable signs of Pisces and Virgo. Saturn entered Libra in October 29 but has recently turned retrograde and moved back into Virgo where it will again oppose Uranus in Pisces. As I said, this is the fourth of five times that these planets oppose each other. (I anticipate that this transit will impact the appointment of a new Supreme Court Judge. More fun for all.) The final opposition of Uranus and Saturn occurs at the end of July when both planets are at the critical zero degree of Aries and Libra. It may be that the previous four oppositions are just training for this one. 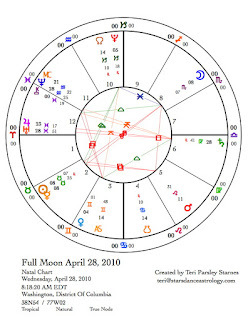 The Full Moon on April 28 occurs just two days after the Uranus/Saturn opposition. A retrograde Mercury is exactly conjunct the Sun in Taurus. The Moon and Sun form a stressful t-square aspect to Mars in Leo (still in the retrograde shadow). If New Moons are for setting intention, Full Moons are for illumination. What is illumined for you about conflict, oppositions, revolution and authority? What are you learning about communication? Every time a light is shown upon something, a shadow is also created. The Scorpio Moon reminds us of shadow and honors the impulse to hide for a while as we attain a degree of safety and comfort. This Full Moon may be a good time to spend alone or in quiet reflection, if possible. During the waning part of this lunar cycle, we wrap up the work we are doing. 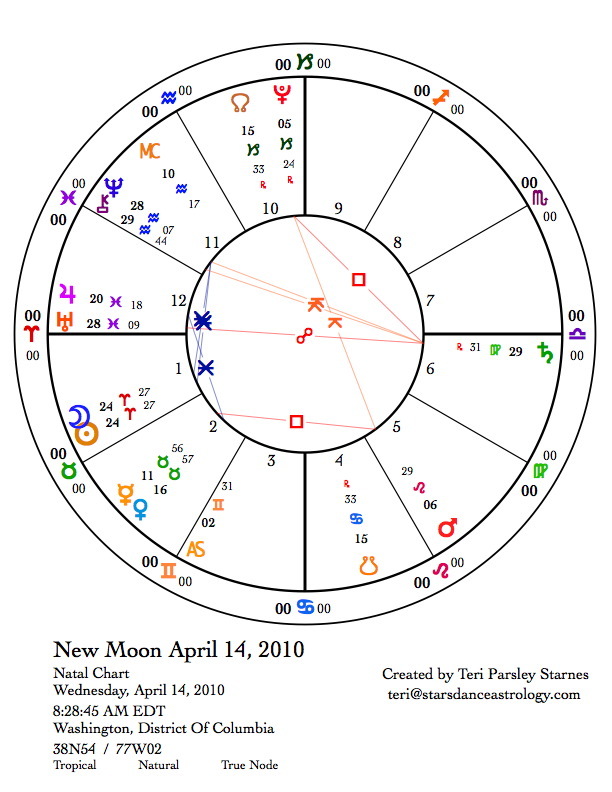 Notably, the Sun squares Mars on May 4 (possible stress concerning our will and energy) and Mercury stations direct two days before the next New Moon. It is terribly exciting to feel this potent moment that encourages us to be fully awake while we learn, engage with others in co-creating our world, and flow with the life-force of firey cardinal energy. To feel this moment, this rodeo of life, is to know we are alive and part of an amazing dance. These dates are not a complete list of transits for the month, but rather are times when the themes of these stories are stronger. Each aspect between planets carries its own energy of harmony or conflict.